Walking dandruff is actually a form of mange, a skin disease caused by the Cheyletiella mite. This type of mange is particularly creepy because of its presentation. The mites move around under the scales of a cat’s skin, giving an appearance of dandruff that is actually alive and moving. Though mites can inhabit the entire body, they are most noticeable on the back of your pet. To make a diagnosis, your veterinarian will perform a physical exam, looking for the characteristic dandruff and mites on your cat’s skin. He/she may use a magnifying glass or microscope to examine your pet’s skin or fur, looking for dandruff flakes that appear to have legs. Your veterinarian may also perform a skin scraping to rule out additional diseases, such as scabies. 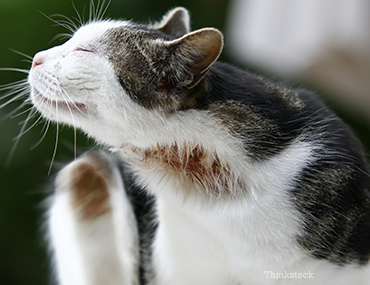 To treat walking dandruff, you need to get rid of the mites on your cat and in the environment. Your veterinarian can prescribe a very effective treatment for this problem, so contact her/him as soon as possible. Parasite-control products are usually effective if used appropriately and for a prolonged period. To prevent reinfection, make sure to treat all animals in your home. There are some simple steps you can take to prevent walking dandruff. These include reducing your cat’s exposure to infested animals, keeping her bedding and environment clean and free of parasites, and checking her often for anything out of the ordinary.